A Blessed and Joyful Thanksgiving Season to our friends and readers of EveryDay Life. As you gather with family and friends, may you thankfully remember the faithfulness of God and enjoy ample provision from His hand. In this season, I am thankful to God for you and your hunger and appreciation for the practical wisdom and wonder of God’s Word. Your recommendation of EDL to family and friends have created growth far more than we would have imagined when we began writing in 2007. EveryDay Life is now read by many thousands in countries worldwide. Thank you for being part of our journey. “In everything give thanks; for this is the will of God in Christ Jesus for you.” 1 Thessalonians 5:18 NKJV. God’s blessings abound in the center of God’s will. In A Tale of Two Cities, Charles Dickens’ novel about the French Revolution explains, “It was the best of times; it was the worst of times . . It was the spring of hope; it was the winter of despair.” Life presents adversity as well as prosperity. While a young teen I remember my Father advising, “More people can stand adversity than can handle prosperity.” You can grow in either, if you keep a Godly perspective with a conviction about God’s faithfulness. In tough times, look for the lesson not the exit. In the genealogy of our Savior, you will find a story of God’s provision and providence amid difficulty, even tragedy. Read the book of Ruth, four brief chapters but the most amazing story of God’s providence and blessing in the midst of adversity. Elimelech and Naomi experienced a famine in Bethlehem. Along with their two sons, they left Bethlehem to find a better life in Moab. Wrongly, they assumed things would be better elsewhere. Their adversity only worsened. In Moab, Elimelech died. Naomi’s sons married, but through tragic circumstances they later died also. Naomi was alone in a foreign land with only her two Moabite daughters-in-law. That’s when she determined to return home to Bethlehem, ‘the House of bread.” I love what prompted her desire to return to Bethlehem. “In Moab she heard that the Lord had visited His people in giving them bread . . now [Naomi and Ruth] came to Bethlehem at the beginning of harvest.” Ruth 1:6/22. Home is a good place to come and harvest is always a good time to return to “the House of bread.” Whatever circumstances lured you elsewhere, being where God provides for you is paramount. God’s blessings are found and abound in the center of God’s will. Naomi left home in a famine, but with all of her family. She returns at harvest, but with far less than when she left. When you lose those you love most, even a famine seems a small thing to endure. Her feelings were real; her assumptions were inaccurate. “I went away full . . I came back empty,” was her sad appraisal. Read Ruth 1:20-22 NKJV. Of course, she didn’t yet know what providentially awaited her return. Read Ruth 4:14-17 NKJV. However disheartening your present experience, God has so much good still awaiting you. See 1 Corinthians 2:9-10 NLT. “Rejoice always. In everything give thanks; for this is the will of God in Christ Jesus for you.” 1 Thessalonians 5:16/18 NKJV. Your blessings outnumber your troubles. Happiness doesn’t come from getting what you want; happiness is being where God wants you to be and appreciating all God has given. In tough times you learn that people and relationships matter more than things. Thanksgiving – every day- is a good time to count your blessings rather than complain. On Thanksgiving, I pray for you to find God’s sufficiency, grateful for His grace. 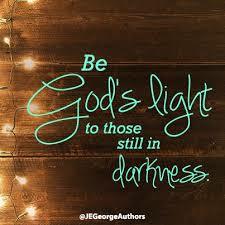 “God is light; in Him there is no darkness at all.” 1 John 1:5 NIV. Anything between you and the Light casts shadows across life. Who has not playfully cast shadows on a wall, forming your hands to project a silhouette of for a child’s amusement? Shadows can amuse but also frighten children. Like children, adults can also become frightened by them. Shadows are dark and loom larger than whatever they project, an exaggeration of a smaller reality. “This is the message we have heard from Him and declare to you: ‘God is light; in Him there is no darkness at all.’” 1 John 1:5 NIV. Light disperses darkness. Shadows result when something blocks the light. Circumstances cause shadows that appear menacing and dark. In a moment, your imagination can create illusions of danger where there may be none. An unfortunate failure can cast a painful shadow for a long time, suggesting you are a failure when you are not. Your past can cast a long shadow, projecting itself as though it were a prediction of their future. Or troubling questions produce shadows, misleading you to think that because you do not have an answer right now that there is no adequate answer. Know this, as Job discovered about our God, “He reveals the deep things of darkness and brings deep shadows into the light.” Job 12:22 NIV. “If we walk in the light as He is in the light, then we have fellowship with one another and the blood of Jesus His Son cleanses us from all sin.” 1 John 1:7 NAS. Anything you allow between you and the One who is the Light will cause life to seem shadowy and uncertain. To disperse shadows, all you need is more light. Jesus said, “I am the Light of the world. If you follow Me, you won’t be stumbling through the darkness, because you will have the Light that leads to life.” John 8:12 NLT. Read 2 Corinthians 4:6 NIV. The Shepherd Psalm reads, “Even though I walk through the valley of the shadow of death, I will fear no evil, for You are with me.” Psalm 23:4 NIV. Whenever and wherever shadows darken your path, you will find Jesus, the Good Shepherd, alongside you. Dispelling shadows is simple; walk in the light, always and only. Jesus promised, “I have come as Light into the world, so that everyone who believes in Me will not remain in darkness.” John 12:46 NAS. “If you are filled with light, with no dark corners, then your whole life will be radiant.” Luke 11:36 NLT. Then you can be God’s light into the dark corners of others’ lives. “You are like light for the whole world . . In the same way, your light must shine before people, so that they will see the good things you do and praise your Father in heaven.” Matthew 5:14/16 TEV. See Ephesians 5:8-9 NLT. Today, I pray for you to always will feel His presence with you, brightening your way. “Anyone who wants to be first, must be the very last, and the servant of all.” Mark 9:35 NIV. and others their rightful place in your life. A little late in life, I am learning that life is less stressful when deciding you do not always have to be first. Conversations are better when you don’t have to have the last word. Games are more fun when you play without having to win every time. Friendships last longer when you realize that being right isn’t the priority. Contentment is more achievable when you don’t have to be better than everyone. People are more eager to help when you don’t care who gets the credit. Those are all deadly symptoms of the “me first” attitude. Jesus made it simple, “Anyone who wants to be first, must be the very last, and the servant of all.” Mark 9:35 NIV. When I was a young minister serving as an associate pastor, I sometimes found it helpful to repeat this rhyme, “It takes more grace than one can tell, to play the second fiddle well.” God challenged me to offer the best that I was capable of doing, for as long as He wanted me to do so. I think I was faithful to that, at least most of the time. Life is easier when you find the joy and satisfaction of living contentedly with who you are, what you have, and where God has placed you. Jesus is first and foremost, no other beside Him, none before Him. When Jesus is has His rightful place in your heart, you will give others their rightful place in your life. “All the law is fulfilled in one word, even in this: ‘You shall love your neighbor as yourself’. . Love does no harm to a neighbor, therefore love is the fulfillment of the Law.” Galatians 5:14/Romans 13:10 NKJV. Often proud and impetuous, Peter eventually learned to put others first, “All of you serve; serve each other in humility . . God shows favor to the humble. So humble yourselves under the mighty power of God, and in His good time He will honor you.” 1 Peter 5:5-6. NLT. Honor comes from above when you honor others from your heart. Read Philippians 2:3-4 MSG. Today, I pray for you to love God first, and love your neighbor as yourself. “God will produce a great harvest of generosity in you.” 2 Corinthians 9:10 NLT. Generosity flows from a wealth of gratitude rather than your abundance. Generosity is an admirable trait in any individual. As you are made in the image and likeness of God, you have a benevolent potential within you. Generosity should be natural but its genuine expression does not naturally occur. Realizing and releasing that latent benevolence is the challenge. See Psalms 112:5-9 NKJV. Authentic, selfless generosity requires a work of grace and impartation of God’s Spirit. “God will give you many opportunities to do good, and God will produce a great harvest of generosity in you.” 2 Corinthians 9:10 NLT. Of that which you sow, God provides a generous harvest. Liberality is the honest recognition and appreciation for God’s and others’ benevolence to you. Generosity flows from a wealth of gratitude rather than your abundance. Whether you realize it or not, you have received immeasurable munificence from many others such as parents, neighbors, friends, teachers, employers, or even the kindness of strangers. And out of His amazing and abundant grace shown you in salvation, God has been extravagant in His mercy and love toward you and me. Read Ephesians 2:4-9 NIV. Generosity is expressed in your choice to give rather than ability to give. See Mark 12:41-44 NIV. In my lifetime, I have found that people with much less wealth and possessions can sometimes be proportionately more generous than those having a greater ability to give. Solomon accurately observed, “The generous prosper and are satisfied; those who refresh others will themselves be refreshed.” Read Proverbs 11:24-25 NLT. Generosity extends beyond mere finances, being also expressed in the kindness of your words to and about others, the joyful helpfulness of doing what you can when you can, or even the esteem in which you hold others. But generosity ultimately touches your possessions and finances. “Good people will be generous to others and will be blessed for all they do.” Isaiah 32:8 NLT. Generous people are happier, friendlier, more satisfied, and more well-liked than people who are restrained. “The one who plants generously will get a generous crop . . For God loves the person who gives cheerfully. And God will generously provide all you need. Then you will always have everything you need and plenty left over to share with others. For God is the one who gives seed to the farmer and then bread to eat. In the same way, He will give you many opportunities to do good, and God will produce a great harvest of generosity in you. Yes, you will be enriched so that you can give even more generously.” Read 2 Corinthians 9:6-11 NLT. Generosity produces a spiritual harvest in the lives of others, as well as your own. Today, I pray for you to allow the Holy Spirit to perfect generosity as a character trait.